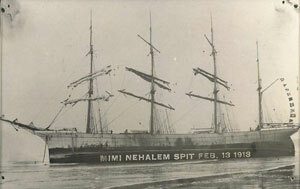 Lost in the fog and mistaking fires on the beach for the lights of a steamer in the mouth of the Columbia, the captain of the German square-rigger Mimi sailed her smack into the Nehalem Spit (about 40 miles south of the Columbia) on the evening of February 13, 1913. Amazingly, no one was injured, and members of the crew were able to walk ashore in the low tide to meet with the insurance adjuster. The tragedy occurred when efforts were made to refloat the Mimi on April 6. In heavy seas 18 perished as the barque capsized during the salvage mission. Sources: Oregon Disasters: True Stories of Tragedy and Survival, the Morning Oregonian, 02-17-1913, and the New York Times, 03-07-1913. Photo from the Tillamook County Library digital exhibits. Thanks for posting this. My grandfather had the salvage rights for this ship, and I still have the barometer from the captain’s cabin. I never know what I’ll find on your blog! My grandfather ( FRIEDRICH HAGGE) was the First mate on Mimi. I am lookingfor morvinformations about this Event. When he died, I was to small to ask him about what happend.